Source: Giovanni Perillo, SINTEF. Illustration: Knut Gangï¿½ssï¿½ter, SINTEF. In Europe, the two unpredictable resources sun and wind are becoming more and more important as key sources of energy. This underscores the fact that there is an increasing need for energy storage facilities because if the generated energy cannot be used instantly then it must be stored until it is required. The most economical approach is to use hydropower reservoirs as ‘batteries’, that is, using the stored water to generate electricity when there is a minimum power supply and then pumping the water back uphill when there is abundant renewable energy. However, this solution is only viable in mountainous regions such as in Norway and several other countries. What if air, instead of water, is used to store energy in less fortunate regions and countries? Under the support of the European Union, researchers across Europe are trying to turn this concept into a practical prospect, through a research project (RICAS 2020). SINTEF is a member of this project. Participants of this project are well aware about all parts of the globe, where sealed, disused caverns can possibly be used as storage sites. 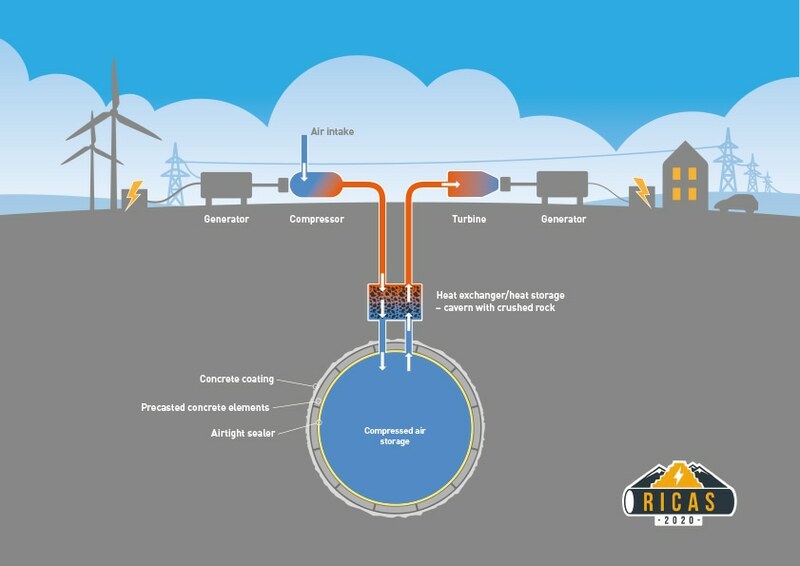 A few sites around the globe have already adopted the general principle, which involves using excess amounts of electricity to compress air, which is subsequently stored in an underground cavern. When there is a demand for power, the air is allowed to pass through a gas turbine that produces electricity. This type of existing plants are usually employed to meet peak demand as a substitute to traditional power plants, and thus provide the right amount of electric power required during different times of the day. The physics controlling the process of storing energy in the form of compressed air is the result of a law of nature known to all bicycle pump users - the process of compressing air makes the pump hot. When air is compressed by bicycle pumps, the pressure in the tyres increases and the pump becomes hot. The more of the heat of compression that the air has retained when it is released from the store, the more work it can perform as it passes through the gas turbine. And we think that we will be able to conserve more of that heat than current storage technology can, thus increasing the net efficiency of the storage facilities. Germany and the USA are the two largest compressed air stores in the globe. The air stores are underground chambers produced in salt formations. However, these plants do not have a system to store the heat generated during the air compression stage, and as a result, end up losing a significant amount of the potential energy of the compressed air. The RICAS 2020 participants have now come up with a new recipe for reducing these energy losses in future underground storage caverns. At the core of this recipe is an additional station that they have integrated in their solution. The hot compressed air, on its way down to the underground cavern, travels via a separate cavern filled with crushed rock. The hot compressed air heats up the rock, which, in turn, retains a large amount of the heat. The main cavern stores the cold air. When the air later returns via the crushed rock on its way to be used to produce electricity, the stones again heat the flow of air. Hot air is subsequently expanded via the turbine that generates electricity. The project manager at SINTEF explained that this technology could probably increase the system efficiency by as much as 70 to 80%, and for most of the existing storage sites the corresponding figures are no better than 45 to 55%, meaning that the generated energy is only 50% of what was initially utilized to compress the air into the underground cavern. The project is based on the belief that our solution will offer better energy storage than batteries can ever provide, thanks to its longer lifetime and lower capital cost per kWh of stored energy. We also expect that it can be employed virtually irrespective of the type of geological formation available. Perillo added that there is only one requirement with regard to the choice of site. There must exist large hollow spaces, because excavating new caverns and making them safe would be very expensive. Therefore, the project participants are envisaging that current disused and sealed underground spaces can be reopened to accommodate the compressed air. As a materials scientist, the SINTEF researcher is responsible for the institute’s R&D efforts in this EU project, especially with regard to the sealing membrane that will be required to maintain the compressed-air storage sites - practically - airtight. In addition, SINTEF researchers are contributing their know-how in underground technology; they have come up with new calculations that will make sure that their unique solutions, including the sealant materials, will be able to endure the pressure they will be exposed to. The EU project will lead to a set of detailed cost analyses and technical specifications. The results of the studies will decide whether or not a pilot plant is set up. In the middle of the Alpine landscape of southern Germany, Dr. Matthias Finkenrath, Professor of Energy Engineering at Kempten University of Applied Science in Bavaria, has been exploring the use of compressed air for storing energy for a number of years. According to him, there are a few plants that are already in operation but poor energy efficiency has reduced our interest in them. Also, during the course of the past 15 years, considerable amounts of money have been invested in developing more energy-efficient models of the compressed-air energy storage concept. Professor Finkenrath further added that the combination of uncertainties in the energy market, low energy prices, and key technological challenges has acted as a “showstopper”, which resulted in postponing and abandoning all the plans for large-scale demonstration plants. Therefore, the professor would be more than happy to see that the EU project meets its objectives. Compressed air stores of the sort that this project is aiming for, could provide significantly lower costs and greatly improve storage capacity compared to for example batteries. If this project leads to storage plants being established under a wide range of geological conditions, that in itself would be an important step forward. If the project partners are also successful with their plans for efficient heat storage, the use of compressed air for energy storage could be on the edge of a breakthrough.